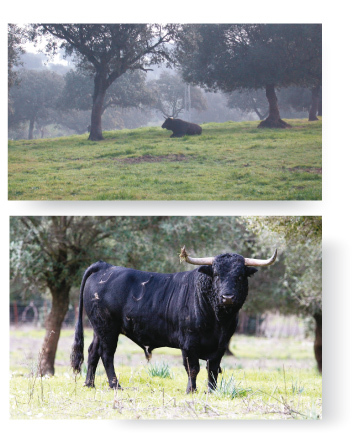 The family of the Marques of Albaserrada have raised fighting bulls for almost a century. MMorphologically harmonious, lustrous black coats, with well-developed and tapered horns, and a temperament that is both brave and fierce; the stamp of the house of “Albaserrada”. On the 12th October 1965, a bull named ‘Laborioso’ exhibited such an extraordinary demeanour during its time in the bullring that the spectators in the plaza of Seville secured from the President of the bullfight a pardon for its life. Laborioso left the arena alive and exalted by the public. He went on to become a stud bull happily working the fields of Mirandilla for a further 10 years. He left as an inheritance to his 400 descendents his exceptional characteristics. In this way, the meadows of Mirandilla continue to be enlightened by his memory.